Before his death in February 2016, radio personality turned pulp writer, Mark Justice wrote “The Dead Sheriff,” a weird western that merged his love of both horror fiction and cowboy movies. Last year Airship 27 Productions proudly produced a new edition of that one and only book. Later, it was learned that Mark had actually begun a second book featuring the creepy lawman and his Indian companion, Sam. After reading the partial manuscript, fellow pulp scribe Ron Fortier volunteered to complete the tale with Mark’s widow, Norma Kay Justice, giving her approval. 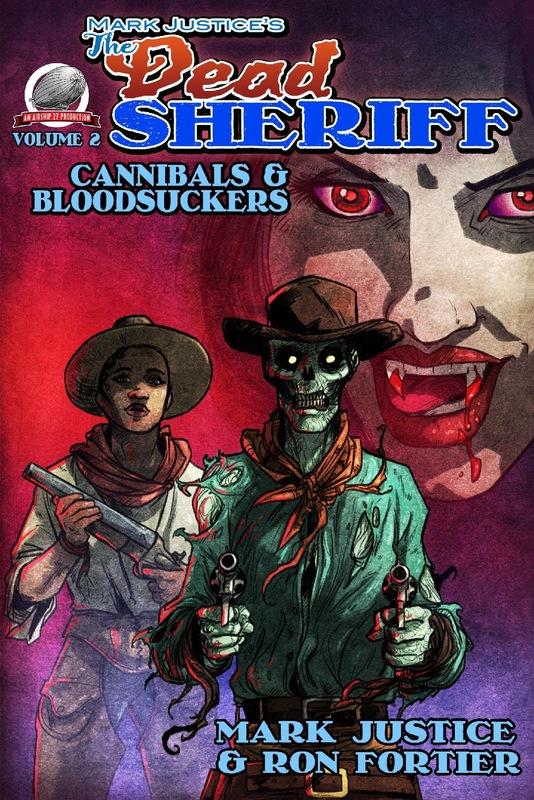 Starting only months after the conclusion of their first adventure, Sam and journalist, Richard O’Malley, along with the Dead Sheriff, find themselves battling twisted cannibal brothers, a traveling bordello of vampire prostitutes and a demon from hell. Can even the Dead Sheriff survive this Trio of Terror? Returning to the series were artists Zachary Brunner (cover) and Art Cooper (interior illustrations) with Art Director Rob Davis on book design. This new book also features a special post-script by Mrs. Norma Kay Justice. So get ready to saddle up for some truly wild and hair raising adventure, pulp fans, as the Dead Sheriff rides again! Available now at Amazon in paperback and on Kindle.